On my recent trip to Hawaii I stayed at the Hale Kai Bed and Breakfast just outside downtown Hilo. Knowing that every B&B is different and has its own style, I wasn’t sure what to expect. 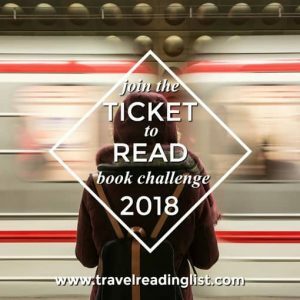 It turned out to be a place that I’m excited to share with The Traveler’s Way readers. 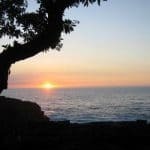 The Hale Kai B&B is in a residential neighborhood outside of downtown Hilo, making it a quiet spot that is just a short drive away from anything you might want to do in town (you will need a car to get there from Hilo or from the airport). From the moment I pulled up into the driveway, the owners, Ricardo and Maria, welcomed me into their home with open arms and were eager to offer advice and suggestions about everything from their favorite restaurants to the best spots to snorkel. And don’t worry if you’ve forgotten your guidebook – they’ll be happy to lend you a copy of Hawaii, The Big Island Revealed. Hale Kai’s location and ambiance make it an ideal place for a couple’s getaway, but children over the age of 13 are allowed if you’re looking for somewhere to take the whole family. 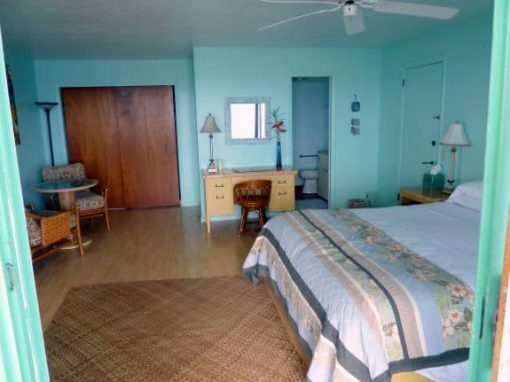 The B&B has four rooms, all of which have oceanfront views and access to a small lanai (patio/deck), and there is a maximum of three people per room. I was in the Moana Room ($170/night), which had a king sized bed, private bath, cable TV, and wi-fi. All of the rooms have king beds except the Heritage room, which has a queen-sized bed. Another nice feature of the B&B is the swimming pool and hot tub. Like many places in Hilo, Hale Kai does not have air conditioning. Each room has a ceiling fan, a screened in window, and a screened in door that can be latched and left open for some air flow. While you can close the drapes and still leave the window and door open, if you are looking for complete privacy, it’s not really possible unless you are in the Pele Suite. Most nights are on the cooler side so you get a nice breeze off the ocean, but it can be a bit stuffy during the day. When you wake up in the morning, be sure to look to the right from the lower lanai to see the surfers catching waves at the beach down the road. Then get yourself to the upper lanai where Maria serves up a gourmet breakfast – the basil feta frittata and homemade mango apricot scones are absolutely delicious! Besides being a gourmet cook, Maria is a landscape designer, and the grounds are lovingly cared for and full of beautiful flowers around the property. Once you have fueled up with breakfast and a cup of Hilo coffee, Hale Kai makes a great home base for exploring the area. 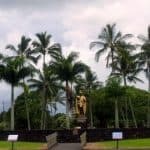 If you’re interested in learning about the history of Hilo, make the 5-10 minute drive into downtown to visit historic Hilo and see all the major sites. If you are visiting the area on a Wednesday or Saturday, check out the Hilo Farmer’s Market for a souvenir or some fresh coconut water. The farmer’s market is just the place to pick up a bag of Hilo coffee, too. If you head the opposite direction, you will be heading into the jungle and along the ocean, and will find lots of photo opportunities. One of my favorite spots was the 4-mile Onomea Scenic Drive, which is part of the larger 45-mile Hilo-Hamakua Heritage Corridor. To get to the scenic drive, turn right onto Mamalahoa Highway (Highway 19) from Pauka’a Drive, and then turn right again at mile marker #7. Along the drive, you can stop at the Hawaii Botanical Garden for a self-guided tour of over 2,000 plant species, including rare and endangered species and an orchid garden. Admission is $15 for adults, and is open from 9 a.m. to 5 p.m.
After finishing the scenic drive, you will come out around mile marker #11. You can turn right to continue along the corridor, or turn left to go back towards Hale Kai or the town of Hilo. 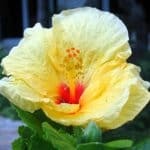 Overall, I had a great experience at Hale Kai Bed and Breakfast. While children over 13 are technically allowed, I would recommend it for couples rather than for a family. If you are looking for something intimate with an ocean view, gourmet breakfasts, and is a bit out of town, this is the place for you. It was really nice to be close to downtown, but not right in the middle of it, and close to the scenic drive. I really appreciated that Ricardo and Maria were there if I had a question or needed advice because I had never been to the island before. Staying at Hale Kai does require that you have a car, but chances are you will have one anyway because there are so many places to explore on the Big Island! 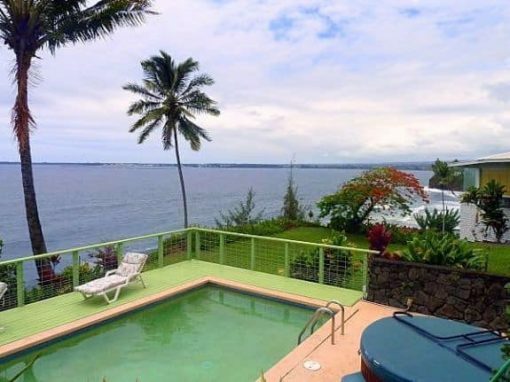 Location: Hale Kai Bed and Breakfast is located at 111 Honolii Place, Hilo. 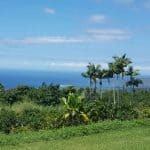 It is approximately 15-20 minutes away from Hilo International Airport. Reservations: Available through the website or by email. In most cases, a two night stay is required. NOTE: My visit to Hawaii was sponsored by the BIVB.